The first segment of our flight was from Hartford to Charlotte and thanks to some soon-to-expire frequent flier miles, we had upgraded to first class for this leg of the trip. CARES was clearly not designed with first class seats in mind, as it was very difficult to maneuver the main loop over the top of the seat (the belts have now been expanded to fit first class seats -- see update at the bottom of this article). However, even with this added degree of difficulty, my husband powered it down and had Ryan strapped in thoroughly in under three minutes. Ryan loved being able to sit in a seat "just like Daddy's!" Click here to go to the CARES web site for more information. 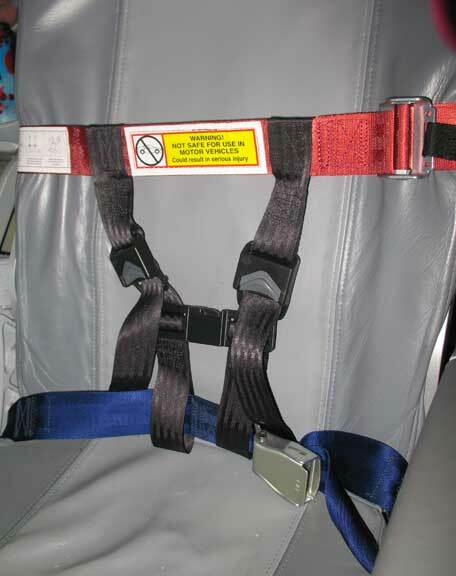 Update to the CARES article from the May 3 issue of PassPorter News: We received an e-mail from Louise Stoll, creator of the CARES in-flight harness system. Louise advised us that the latest model of CARES, the only one currently available for purchase, has been widened to better accommodate first-class seats. She also filled us in on a little of the background behind the "Crotch-strap" debate: "Jennifer's review was comprehensive and accurate - on the whole very very good and I am delighted with her comments. The bit about wishing there were a "crotch strap"to keep the child from sliding requires a bit of background. 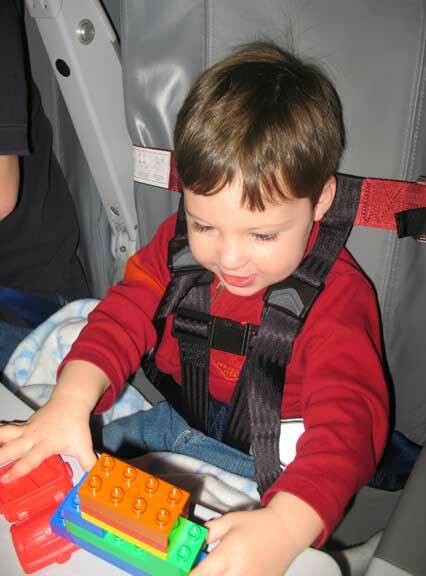 I initially proposed a crotch strap in one of my several early iterations for CARES which, given that there is no hook on the bottom of the airplane seat to attach it to, had to go either between the child's legs, or around each leg separately, and up his backside and attach to the red loop - basically placing him in a kind of sling between his legs. There is no other way to attach the back end of a crotch strap. The FAA believed that a child could get injured in turbulence or a short stop by the crotch strap and I understood their point and think they were right to proceed without it. During the certification process the FAA did serious dynamic testing with instrumented dummies in CARES and in the lap belt alone to look for evidence of "submarining" - the sliding down that Jennifer described her child doing. With the lap belt alone submarining was a problem. With CARES, the FAA found no evidence of submarining when both the lap belt and the shoulder straps were snugged down properly. I advise them to snug all the belts and straps down a bit, and, of course, if the child does slip down to do as Jennifer did - reposition the child, be sure all the webbing belts are properly positioned, and then snug everything down." Our thanks to Louise for the information!